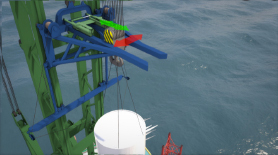 The Boom Lock© is an intelligent guidance system that allows an offshore crane to install wind turbine components at wind speeds that were previously impossible to work in. 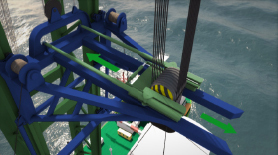 Capable of lifting multi-MW turbine blades in 15m/s winds, the Boom Lock system allows complete control over the hoisted load during the lifting process. 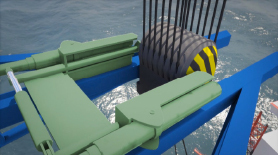 Available for all turbine manufacturers, contractors and jack-up owners, the Boom Lock is specially designed equipment that can be mounted on any jack-up vessel crane. It provides maximum control of the crane hook and load – such as a turbine blade, nacelle or tower section – during the lifting process. 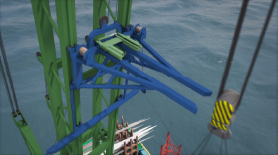 The first Boom Lock was completed in January 2015 and undertook extensive testing at the REBO site in the port of Ostend. Here, it outperformed the design specification by keeping a 6MW turbine blade steady in wind gusts of up to 20 m/s. 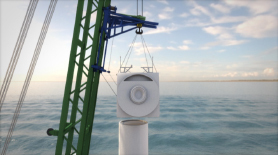 In its first major offshore turbine installation project, a Boom Lock system was used in installing 15 MHI Vestas V112 3.3MW wind turbines at Vattenfall’s Kentish Flats Extension. Boom Lock is certified by ABS to lift turbine components at a 20m/s wind speed, and tests with a 6MW turbine blade proved its capability of lifting blades safely at 15m/s wind speed with gusts up to 20m/s. 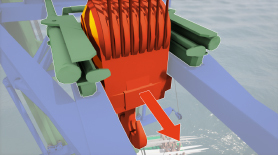 From the moment the clearance to the crane boom becomes critical, the crane hook is locked in the Boom Lock frame. At this stage, only the lateral movement of the crane hook is locked by the Boom Lock. When the installation reaches a critical point, the crane hook will be locked securely by the catch mechanism on the Boom Lock frame. The hydraulic system on the Boom Lock frame enables high-precision adjustments.